Since FF33, this user has an issue with OMTC, the text is missing in UI/webpage, even if the UI is not broken like in bug 1083071. Upgrading to 33.0.1 didn't fix the issue. He tried to disable OMTC (layers.offmainthreadcomposition.enabled=false), text was back but he got some UI issues with black areas appearing sometimes. jack, could you type about:support in the location bar and paste the "graphics" section, please. Here you go. This is off Waterfox (which I am temporarily running so I can get stuff done). 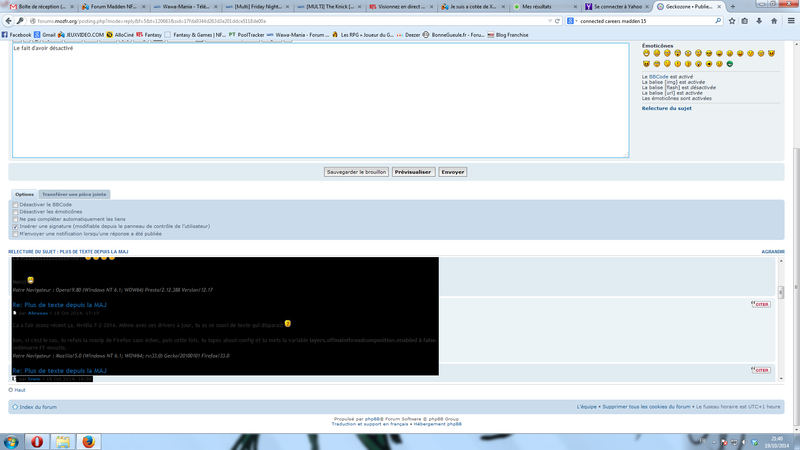 You can use Firefox with OMTC disabled, it's a workaround, not the best, but it works. I think that disabling D2D is a good workaround for this issue (set the pref gfx.content.azure.backend to cairo and restart the browser). > gfx.content.azure.backend to cairo and restart the browser). On the French board, the user tried your tip and it didn't work. Do you think it's an issue with some models of the serie NVIDIA GeForce GTX? > Do you think it's an issue with some models of the serie NVIDIA GeForce GTX? No idea. I have a laptop that reproduces this issue and it is fixed when D2D is disabled. The driver version reproted in this bug is very recent (the one I have uses intel+nvidia drivers from 2011). I haven't found a good correlation so far and it looks like it is several issues showing the same symptoms. If there are a few French users in Paris who can swing by the office someday and let me have a look at their computer for an hour or two I'm interested. There was one problem with fiddling with about:config: you can’t see anything in there, either. I typed about:config, copied and pasted layers.offmainthreadcomposition.enabled, right-clicked, and toggled the first option, but I was doing it “blind”. I did this once, then restarted Firefox, no joy. I did it again, in case I had done it twice accidentally on my first go, and still there was no text. I wonder if this was the right way to switch off OMTC. I’ll attach a screen shot of what I saw (or couldn’t see) under about:config so you can see what I mean. The latest Waterfox suffers from the same bug, so I’ve downgraded to the previous version as I had the set-up on my HD. It’s hard to make changes in about:config as you have to do it blind. You can start Firefox in safe mode then change the pref in about:config. Thanks, Loic. I’ll give it a go on the next boot. Loic, I tried your suggestion, but even in safe mode there’s no text. I tried toggling but it’s very hard doing it blind. Is there a resolution on this? Couldn’t Firefox ship with OMTC turned off? Or does that cause problems for other users? Launching Firefox safe mode—subsequent windows have no text, either. This seems to be non-D2D related, if we're seeing Cairo for content? > This seems to be non-D2D related, if we're seeing Cairo for content? It's not entirely clear from the reports. These might be about:supports from after people having tried to disable D2D. Hi everyone: tonight, after finding that Waterfox 32 was crashing thrice daily (it keeps increasing) I had to look for an alternative. I downloaded Cyberfox, which does display text on my set-up, even with OMTC and hardware acceleration switched on. I guess this means one of two things: (a) Cyberfox handles typography differently (certainly its rendering isn’t as good as Firefox’s or Waterfox’s): some of the fonts I have don’t display as “true” to their original designs as on the last Firefox that worked for me, and I include linked (@font-face) fonts; or (b) as Cyberfox forces us to have a new profile, then there is something in the old profiles that caused Firefox to display no text. Hopefully this helps the above dialogue. Oh well, scratch the above. On rebooting this morning, Cyberfox does exactly the same thing as Firefox and Waterfox. I’m beginning to be very suspicious about the Postscript fonts, and that they could be affecting the typography. It sounds like this is a problem that relates back to a 2011 bug. An update here. The PostScript fonts which I use for icon text, etc. have since been replaced with OpenType and TrueType ones, but it makes no difference to the browser. The fonts themselves are part of a larger family, which either Windows or Firefox may have trouble with. PS. : The way Cyberfox is handling fonts today (the rasterization and the sub-pixel rendering) is now the same as the way Firefox and Waterfox handled it. So yesterday’s post-installation success does suggest that initially, at least, Cyberfox was handling type differently. Whatever setting causes it to display differently needs to be the default, but I have no clue (as a layman) what that might be. Another update. Sorry about all these but I think I am getting a bit closer to the culprit. I’ve just reinstalled Cyberfox and the nice type rendering is back, along with all my text (regardless of font format). Whatever it is doing differently in terms of displaying fonts is the answer to all of this. As you are able to reproduce it, could you use the tool mozregression to find a possible regression range, it will help to narrow the underlying regression. Loic, and others, fixed as of now. Solution: turn on hardware acceleration. Cyberfox had this turned on by default. When I switched it off, nothing happened. But when I switched it off and restarted the browser, boom, all the text vanished. I’ve now switched it back on in Firefox 34.0.5 and everything is back to normal. It seems the conventional advice is to turn it off, which I did months ago on some other error. I did it with Cyberfox when I got it to preempt these issues. But it seems that is actually the cause of these issues. > Loic, and others, fixed as of now. > Solution: turn on hardware acceleration. This means that (at least in your case) the issue is most likely specific to the cairo drawing backend. Good to know, thanks. Nicolas, you’re welcome. I hope it helps in some small way.